The EU-India Platform for Social Sciences and Humanities (EqUIP) is pleased to announce its first research funding call. 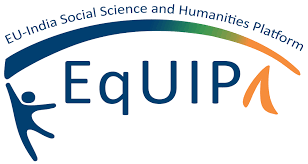 The call aims to bring together a number of social science and humanities funders in India and Europe to support excellent and innovative research on sustainability, equity, well-being and cultural connections. The emphasis of the research will be on Indian and European dimensions, in both contemporary and historical contexts. With a total funding of €5.5 million, it is expected that six projects will be funded. Researchers from India, Finland, France, Norway, Poland, Slovenia, Switzerland and the United Kingdom are invited to apply. The deadline is 30 November 2017. Researchers interested in networking with others engaged in Europe- Indian collaboration can subscribe to the JISCMail mailing list here. The EU-India platform Coordination Office (hosted by the ESRC) will send out occasional news, and news can also be shared between subscribers to the list with one another. If you are considering applying for this or any other international funding call, please contact Emily Cieciura, RKEO’s Research Facilitator; EU & International Funding.